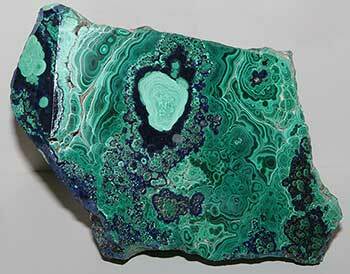 Malachite with azurite - Cu2CO3(OH)2. An almost pure copper sheet formed between layers of shale. 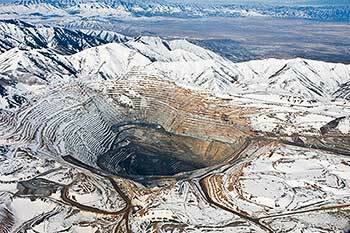 Kennecott Bingham Canyon Mine, Utah. The amount of copper believed to be accessible for mining on the Earth's land is 1.6 billion tons. In addition, it is estimated that 0.7 billion tons of copper is available in deep-sea nodules. Mineral-rich nodules of magnesium, copper and other metals are known to form as a product of deep-sea volcanic activity. Retrieving these nodules from the sea floor is as yet too expensive to allow this to be a major source of copper. 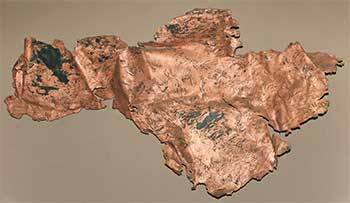 Copper is mined mostly in open pit mines, such as those found in Utah, New Mexico, and Chile. Chile produces the largest percentage of the world's copper with nearly 33% of the world's export. Copper is also found in the U.S., Indonesia, and Peru. Although copper has been used for thousands of years about 95% of all extracted copper was mined within the last hundred. In addition to the many mines found all over the world much of the copper we use has been recycled. Copper is one of the oldest metals used in many ancient cultures, with evidences suggesting its usage up to 10,000 years ago. By around 5,000 BC methods of smelting the copper had been devised. Egyptians and some other cultures used copper for medical reasons, such as sterilizing wounds and water, treating infections, sore throats, etc. Alloys made to make brass or bronze were discovered around 2,500 BC during the Bronze Age. Alloys were used in Egypt because they were easier to cast. Copper was used highly during the Bronze Age with the deepest mine during that time period found in Wales nearly 70 ft. deep. Copper became important for the Romans and the Greeks. The name 'copper' comes from the Roman name aes Cyprium, because of the large quantities of the element mined in Cyprus. This was later simplified to Cuprum, which is where the modern word copper is derived. The Romans associated copper with the goddess Venus. This was due largely to its beautiful color, as well as the island of Cyprus, which was considered sacred to the goddess and contained high concentrations of copper. Romans would also use copper for money. Copper plating began in the early 1600s and was used to protect ships from algae and other materials due to its germicidal properties. It was used in the formation of the Statue of Liberty, shipped to the United States from France. In the early 1800s copper wire was discovered as a conductor but it wasn't until later that it was identified as a superconductor and mass produced for such a purpose. Today it is used as the conducting material in most wires. Many ancient copper mines have been discovered in Michigan and appear to have been mined thousands of years ago. Knowledge of large copper deposits by the Great Lakes was known early on, as far back as the early 1600s. Dr. Roy W. Drier dated finds from the copper mines as being mined 1,800 BC to 1,000 BC, give or take 300 years. In fact the mining probably began as early as 2,000 BC. These discoveries conflicted with the man-made theory that Columbus and those that first arrived from the Old World were the first 'real' civilized people in the Americas. Remnants of copper mined in these North American mines have been found all over North and South America. In fact, some North American copper has been found in other parts of the world including Egypt1, which suggests the copper was at one time exported by an American civilization thousands of years ago. 1. J.S. Wakefield, "Michigan Copper in the Mediterranean: Isle Royale and Keweenaw Peninsula, c. 2400BC-1200BC," Ancient American 13:84, 10-15.